Amazon Music Unlimited, alike Spotify and Apple Music, is a kind of streaming music service which features stream over 50 million songs online and thousands of expertly crafted playlists and stations. Users can enjoy the music with no ads and unlimited music skip if they subscribe to Amazon Music Unlimited for $9.99 per month (or for extra $7.99 a month if you are an Amazon Prime member). Absolutely Amazon Music Unlimited users also able to download the music for offline listening within the subscription. One thing you need to pay attention to is that you have to keep the subscription in order to keep listening to music on this platform or streaming music to Echo, Echo Dot and Amazon Tap. Besides, you should install the Amazon music app on the devices for listening. Well, is there any way to download music from Amazon and listen to the music without the app? Yes, we sure there is, and we would like to recommend TunePat Amazon Music Converter to you, which can download Amazon music and no need to install Amazon app to your computer. 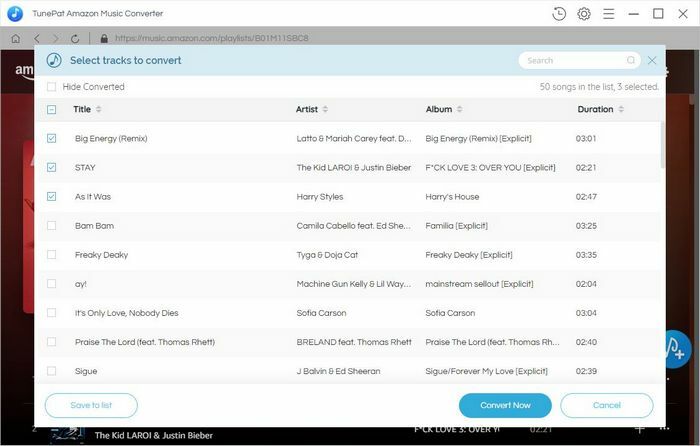 TunePat Amazon Music Converter is a professional music converter designed for converting music from Amazon Music Unlimited to MP3/AAC/WAV/FLAC format. No need to install extra Amazon app, it is able to convert Amazon music at 10X conversion speed with sound lossless. How to Download Amazon Music with TunePat Amazon Music Converter? TunePat Amazon Music Converter is available for Windows version and Mac version. Please download and install the correct program in advance and sign in with your Amazon Music Unlimited account. 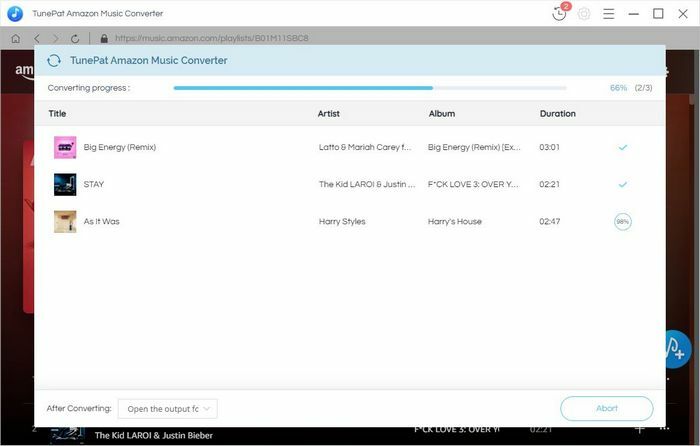 Now we will show you step by step how to use the program to convert Amazon music. 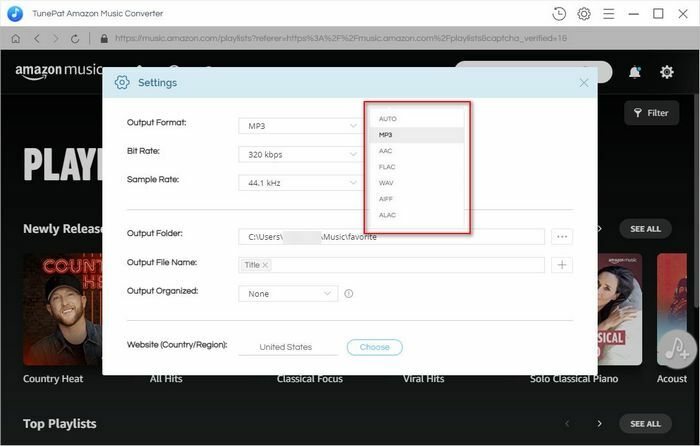 Click the button, you can customize the settings here, like output format, output quality, output path and also the country/region. Open one playlist or album and type the button, TunePat will grab all songs in the list automatically and then select the music you want to convert. After adding music to TunePat, please click "Convert" button and a new windows will pop out that presents the process of conversion. Once the conversion finished you could check the conversion history by clicking the "History" button or you could find the folder on your computer. Note : The free trial version of TunePat Amazon Music Converter enables us to convert the first three minutes of each song and convert 3 music files at a time. We can unlock the time limitation by purchasing the full version.